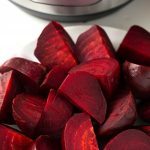 Instant Pot Beets are really simple to make. I like to make a big batch and eat some right away with butter and salt, or olive oil and balsamic vinegar. 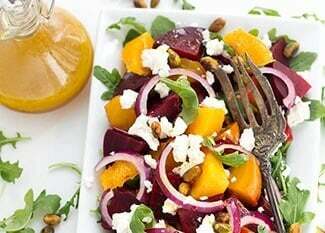 Then use the rest for my 3 favorite pressure cooker beets recipes, that I’m sharing with you! Paul has the week off, so we have been doing a lot of running around. We stopped off at our local farmer’s market to see what was fresh, and they had beets! I was excited because they had red and golden beets! So of course I bought both! 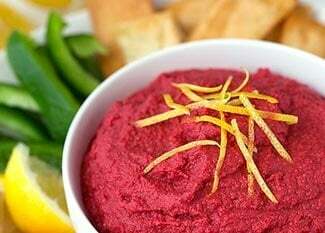 Beets, (also called Beetroot in some parts of the world) are delicious. They have a sweet, earthy flavor, a pleasant texture, and are so pretty! Of course, they are nutritious, too! Cooking beets in the Instant Pot successfully is all about the size of the beet. My suggestion is when you buy your beets, try to get them all about the same size. That way they will cook to the same doneness. Also, when you prepare them for cooking, try not to pierce the skin, and if you are trimming off the greens, leave a little at the tip. This ensures that the beets won’t lose too much of their wonderful, nutritious juices while cooking! 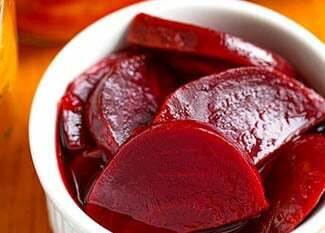 Beets cooked in the oven can take up to an hour, whereas Instant Pot Beets take no more than a half hour, in most cases (Beets are done when you can stick a knife in it easily). I’m not going to say that one method is better than the other. I love beets cooked both ways, as well as boiled. It depends on what I’m making, and how much time I have. The fun part! Peeling cooked beets really isn’t that bad, but it can get messy, as beet juice stains EVERYTHING! I have some food service gloves that I purchased online that I wear for peeling and chopping cooked beets. If I happen to get beet juice on my counter, which is a light color, I wipe it up right away. If it does stain, I just use a little bleach in some water and wipe it right off! 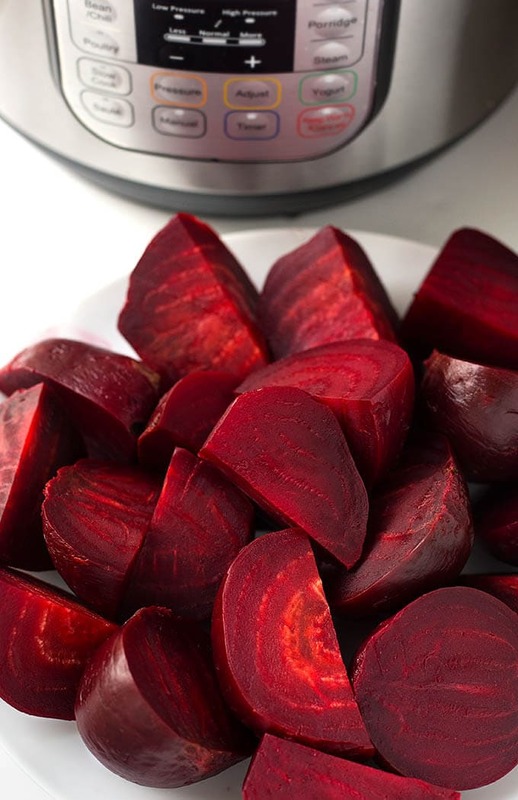 To peel these Instant Pot beets I just run them under cold water and start rubbing the skin off (still wearing gloves!). If there is a stubborn peel, just grab a paper towel and try rubbing the peel off with it. Once the beets are all peeled, you can chop them to the size you need for the recipe you are going to make. 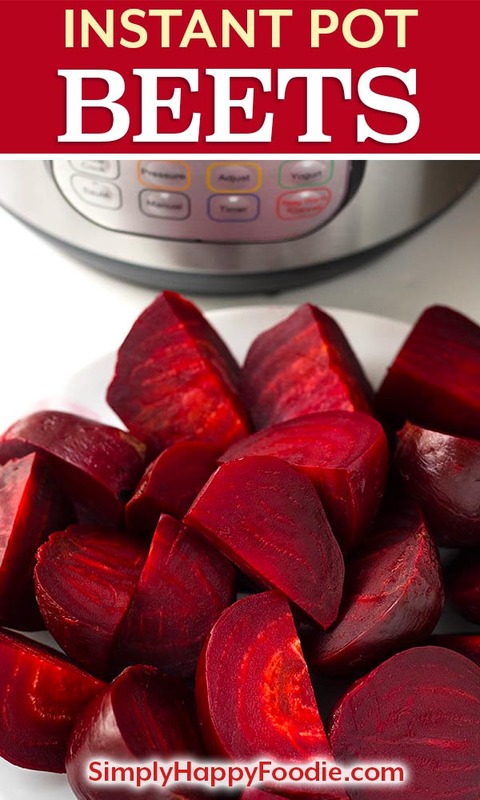 Instant Pot Beets are easy to cook in your electric pressure cooker. Eat them right away or make your favorite pressure cooker beets recipes from them! Pour the water into the inner liner of the Instant Pot. Place the trivet/steamer rack in the pot. Rinse and scrub the beets, but don't peel or cut them. Place them on the trivet/rack in the pot. See cook times below to choose the time to cook your beets. Press the Manual (or Pressure Cook) button, and use the +/- button to adjust the cook time in minutes (times are below). High Pressure. When cook cycle is done, wait 5 minutes and then do a Quick Release of the pressure. Do this in short bursts at first to ensure no beet juice spews out with the steam. Smaller Beets - 7-10 minutes (some beets are really small 1" - 2" in diameter, so cook those on the lesser time). *If you like a very tender, soft result, add 2 minutes, or let Naturally Release for about 5 minutes. Results may vary depending on age of beets, your altitude, your brand of pressure cooker, etc. I have a recipe booklet that belonged to my Nana from 1946 called Cooking Made Easy with a Wear-Ever Pressure Cooker. The beet cooking times come from there, and were modified for the electric pressure cooker from tests I've done. Your results may vary. Can I pile up the beats or should there only be one layer on the trivet? Hi Alex! Go ahead and ‘drop those beats’ in a pile, if you want (sorry, couldn’t resist!). Hi Sandy. I followed your instructions for beets here (my second recipe in the instant pot mini, and from your site-first was the delicious black beans!). While the beets came out great, when I released the steam, it spewed out beet steam/juice all over my counter! Is that normal, or what did I do wrong? Thanks so much! Hi Allison. Oh my goodness! I’ve never had that happen with beets. The only thing I can think of is that in the mini the liquid level is higher. So what you can do next time is take a minute off the cook time and let the pot sit undisturbed for 5 minutes after the cook cycle is finished. Then when you release the steam, do so in short bursts until you can be sure nothing but steam will be spewing out. I call this a controlled quick release. Use this technique for full pots of soup, mac and cheese, and such. Ugh, that must have been a mess. Were you able to close it before too much came out? There are times for the different sized beets in the instructions. I would cook for the larger beets and let the smaller ones get really done, or cook them in separate batches. I don’t know if you could cut the larger ones down, but that could also be an option. Can’t get better than that! Thank you for letting me know! Havent used your recipes yet, but copied them, so expect to, soon. Would like to know which steamer basket you prefer. Hi Laura! The steamer baskets I like are in my Accessories Post Here. I use them a lot! Does the setting have to be on low or high? Hi, so do I peel the beets after they are cooked? Hi, in the post I have instructions on peeling the beets.